When an organization depends on partners to work directly with its customers along key points of the relationship lifecycle, delivering a consistently good customer experience becomes an even greater challenge. In business for more than 55 years, this market-leading real estate developer has a laudable vision to create livable communities with sustainable buildings, public spaces, and neighborhoods where people have easy access to jobs, transportation, and local amenities. The company also owns and operates a diverse portfolio of residential and commercial properties. Running this complex business involves a large network of partners: marketers, builders, designers, and property managers, all of whom join experienced staff to deliver the customer experience under the developer’s brand. This scenario makes delivering a consistent, delightful customer experience difficult to quantify, control, and track, and opens the door wide for disconnects that can harm customer loyalty. In this case, poor survey performance results provided a better learning opportunity than positive ones, especially for a successful organization with a long history and a lot of partners. To anchor insights in data, the team used Touchpoint Mapping—an easy-to-use SaaS-based customer insights platform— to identify pain points and illuminate disconnects between what the developer perceived and what their customers experienced. By providing a 360-degree view of the customer experience and its impact on loyalty across channels, journeys, and segments, insights generated through the platform helped guide a clear roadmap for making measurable improvements. Poor performance results provide a better learning opportunity than positive ones, especially for a successful organization with a long history and a lot of partners. “Exceptional service” was the single greatest under-performer of the study. A customer-centric perspective of journeys, expectations, pain points, and perception drove a data-based view of performance gaps and opportunities. With objective metrics at hand, the client had the data to hold partners and divisions accountable. In immediate need of repair were caretaker issues around maintenance, security, and responsiveness. Findings also revealed opportunities to better customize marketing by properties, customers, and regions. These initiatives fit into one new viewpoint: converge and integrate. Converge what had been viewed as disparate business lines, integrate information and processes, and provide a seamless customer experience that reflects the organization’s brand values—and consistently meets customer expectations. There were significant gaps between employee and partner perceptions of customer loyalty and satisfaction, and actual customer loyalty and satisfaction. 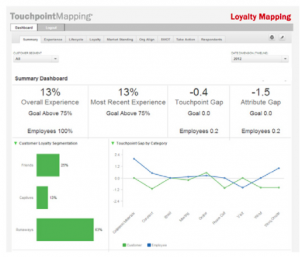 The Loyalty Mapping dashboard clearly laid out what and where. Customer-centric insights helped this organization see where improvements were needed and where to take action in the future. By looking at performance gaps as opportunities for improvement, and positioning threats as a way to create new market differentiators, the client and their teams viewed the data with enthusiasm and productive energy. By aligning employees and partners with a shared vision of customer experience excellence (and the data to measure and monitor success), the company was able to focus on “delighting” customers at the touchpoints and across the channels that matter most, while closing gaps across the journey. As a team, they now see that enabling a consistent experience that delivers at or above customer expectations is the greatest loyalty driver of all.